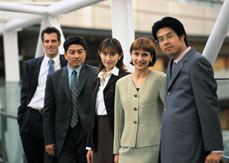 Business success worldwide can only be achieved through people. Managers need to be educated to respond rapidly, flexibly and effectively to the ever increasing pace of change in the business world. It is a complex task to develop programmes which provide an understanding of a range of business disciplines closely linked to their applications, and to facilitate the development of individual management skills. This comprehensive advanced diploma program in Accounting and Finance aims to train and to bridge professionals in the fields of Finance, Accounting, Business Administration or to those who are intending to pursue a career in this financial and accounting fields. 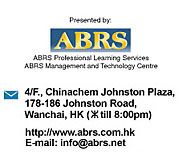 The Advanced Diploma in Accounting and Finance offered and awarded by ABRS will consist of 6 modules. The program will serve as a benchmark or gateway for students graduated with various awards to prepare the necessary academic background before entering onto the final year of the Bachelor of Art (Hon) in Accounting and Finance offered by University of Greenwich, UK. This 4 to 9 months Advanced Diploma in Accounting and Finance program will be operated on a tri-semester basis: spring, summer and autumn. Each module consists of 20+/30+ hours face-to-face lectures, an assignment and a 3-hours examination. The Advanced Diploma is accredited by University of Greenwich  Accounting/Finance School as one of the entry requirement to the final year BA (Hon) in Accounting and Finance. Students possess (1) Diploma/higher certificate/associated degree in accounting/finance from one the recognized educational institutes/universities, or (2) passed or exempted ACCA Level 1, or (3) passed or exempted CIMA examination 2 out of 8 papers at intermediate level, or (4) Passed HKMA and Lingnan University DMS, or (5) passed or exempted HKAAT, or (6) Higher Diploma or equivalent in other disciplines with strong accounting/finance background and work experience, or (7) Other qualifications are welcome to apply and will assess on case by case basis. A fee pay to University of Greenwich if you want to use the advanced diploma as an official qualification to enter to University of Greenwich (final year) degree program in BA (Hons) Accounting & Finance.